Azul Agave is the newest Mexican Restaurant featuring authentic exquisite homemade Mexican food and luxurious libations, premium Tequila, quality cocktails, blended drinks and wine. Azul Agave opened in December of 2016 and is located at 1561 S. Palo Verde Blvd in Lake Havasu City, Arizona. 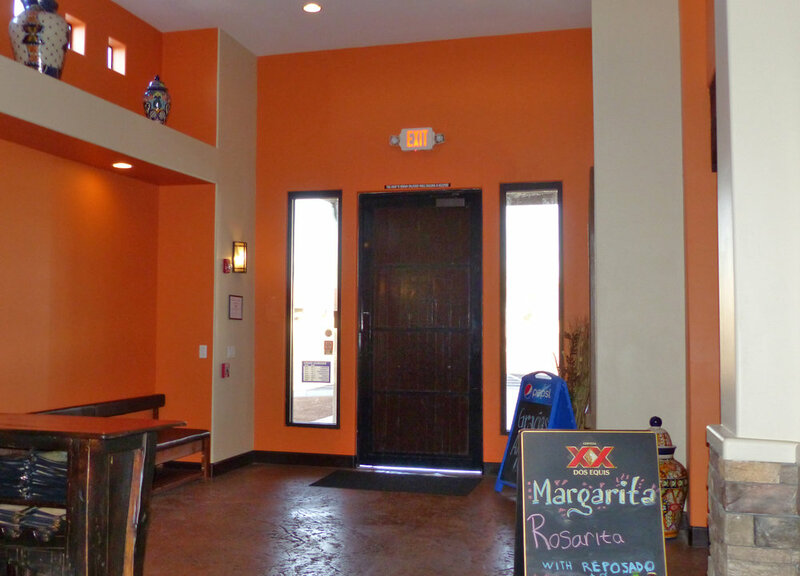 Azul Agave was previously Plaza Bonita at another location in Lake Havasu, so the owners have a strong commitment to Lake Havasu City patrons. 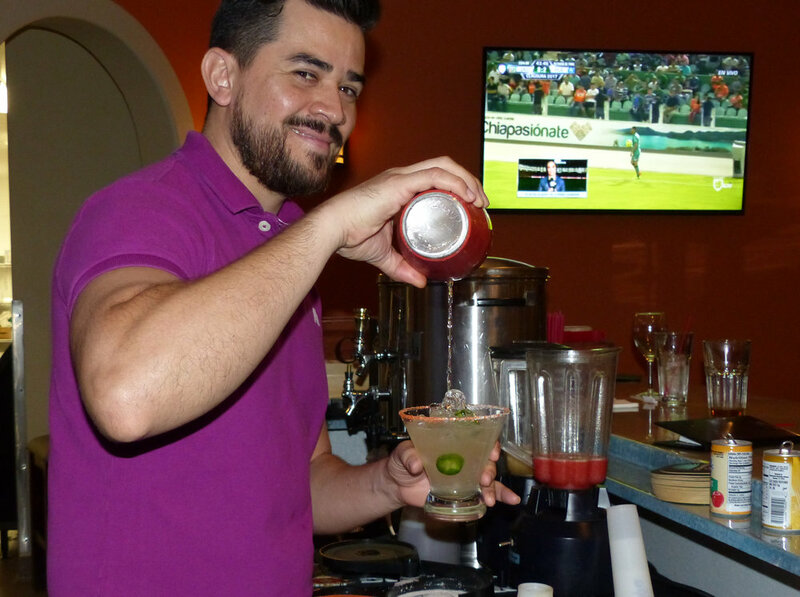 They have been serving both quality homemade authentic Mexican dishes, great beer, cocktails, wine and blended drinks for many years. This is a class act Mexican Restaurant. 1/2 Price Appetizers and $3.50 Margaritas, Wine, Beer & Well Drinks! Chips with chicken or beef, beans, cheddar cheese, guacamole, sour cream, onions and tomatoes. Large flour tortilla lightly fried and topped with melted cheese. Shrimp sauteed in our special red sauce with mushrooms and spices, served on a bed of rice. Three crisp tortillas filled with chicken or shredded beef served with sour cream, guacamole and special mild salsa. Flour tortilla filled with rice, beans and your choice of meat, topped with cheese, lettuce, guacamole, sour cream, tomato and onion. Pork, chile verde, rice, beans and cheese, wrapped in a flour tortilla smothered with guacamole, tomatoes and onions, topped with enchilada sauce and ranchero cheese. Shrimp sauteed with garlic, onions and mushrooms with Green Tomatillo sauce. Served with rice and beans. Colorado Classic, beef braised in mild red sauce, rice and beans wrapped in a flour tortilla, smothered in red sauce, cheese, sour cream and guacamole. Tender pieces of marinated grilled beef or chicken, wrapped in a flour tortilla, topped with melted cheddar cheese, guacamole and sour cream. Served with rice and beans. A coastal favorite, soft tortillas filled with prawns, sauteed tomatoes, onions and cilantro covered with a delicious creamy sauce. Corn tortillas filled with your choice of chicken or beef, in a rich mole sauce. Served with rice and beans. Corn tortillas filled with your choice of meat, topped with green salsa, cheese, lettuce, guacamole, sour cream, tomatoes and onions. Served with rice and beans. Two flour tortillas rolled and filled with Dungeness crab meat, scallions, onions, cilantro and spices. Topped with Monterrey Jack cheese and a special “tomatillo” (Mexican tomato) sauce and sour cream. 3 Tacos, 1 Carne Asada, 1 Al Pastor, 1 Fish Taco, Salsa, Cilantro. Served with rice and beans. Three warm soft tortillas with marinated pork served with cilantro and pico de gallo sauce. Slowly roasted marinated pork. Served with rice and beans, salsa Mexicana in the tacos. Soft tortillas filled with Mahi Mahi fish with homemade dressing and our delicious “Salsa Mexicana”. Soft tortillas filled with shrimp, homemade dressing and our delicious “salsa Mexicana”. Served with rice and beans. Grilled chicken with bacon, cheese, onion, tomato and lettuce. Classic burger with bacon, American cheese, onion, tomato and lettuce. Thin slices of grilled carne asada with avocados, onions, whole beans and crispy tortilla strips on top. Served with dressing. White meat breast only chicken strips charbroiled and served atop our unique Caesar salad with shredded Parmesan cheese and seasoned croutons. Traditional Mexican salad made with shredded beef “picadillo”, Romaine lettuce, tomatoes, onions avocado, and green olives. Marinated in our vinaigrette dressing and served in a large tortilla shell. Grilled shrimp, Romaine lettuce, tomatoes, onions, avocados, corn tortilla strips, with mango citrus vinegar dressing. Fresh Romaine mix, tomatoes and onions with crunchy chicken and tortilla strips on top. Served with delicious fat free Raspberry vinaigrette dressing. Flour shell, Romaine lettuce, in a crispy flour tortilla shell. Served with sour cream and guacamole. Vegetables with rice and black beans in a red sauce. Fresh seasonal vegetables. Served with rice and beans. Lightly sauteed fresh seasonal vegetables, rice, whole black beans wrapped in a flour tortilla. Topped with a zesty burrito sauce and salad greens. Sauteed vegetables, black beans and cheese. A fresh vegetable medley sauteed in a well seasoned tomato sauce. Served with rice, whole beans and warm tortillas. Delicious Mexican soup, made with fresh minted pork meatballs and seasonal vegetables in a clear broth. Served with diced onions, cilantro and warm tortillas. Choose 1 item: Enchilada, Taco, Tamale or Tostada. Choose 1 item: Chimichanga, Burrito, Quesadilla, Chili Relleno. Enchilada and choice of 1 item: Taco, Tostada, Tamale. 2 Tacos, Carne Asada, Rice and Beans. Two fish tacos, Rice and Beans. Burrito Carne Asada, Rice and Beans. Our signature item! Tender sliced chicken breast or prawns specially prepared with fresh mushrooms, onions and green peppers. Served on a bed or rice with melted Monterey Jack cheese smothered with our special mild sauce. Served with warm tortillas (not served with beans). Pork Loin braised in a green sauce of special fresh “tomatillos” green peppers, onions and spices. Served with warm tortillas, rice and beans. Beef, simmered until very tender, in a red sauce of tomatoes, onions, mild peppers and spices. Served with warm tortillas. A bed of Spanish rice, topped with sauteed chicken, broccoli, mushrooms, green peppers, onions and topped with melted Monterey Jack cheese (not served with beans). Tender pieces of Chicken or Beef grilled meat. Served with refried beans, rice, guacamole, sour cream, lettuce, cheese, salsa Mexicana and warm tortillas. A long time Favorite! Braised skinless chicken breast in a sweet yet spicy, peanut butter-based sauce with a hint of chocolate. Served with warm tortillas. All Lunch Specials include rice and refried beans. You may substitute whole or black beans for the refried beans. Served 11:00 am - 3:00 pm - Monday to Sunday. Chile Relleno, shrimp enchilada and a taco, fish or Carne Asada. Traditional Mexican Taquitos! Three crisp corn tortillas, filled with your choice of chicken or shredded beef “picadillo” served with sour cream, guacamole and a special mild salsa. 3 Enchiladas, 2 Carne Asada, 1 Shrimp with 3 different sauces, Red, White and Green. Served with rice and beans. 1 Crab Enchilada, Salsa Verde on top, 1 Fish Taco, 1 Chile Relleno full of shrimp with a cream sauce, rice, and black beans. Large prawns sauteed with garlic, butter, mushrooms, spices and covered with “special” Mojo de Ajo sauce. Served with rice and beans. Fajita style large shrimp wrapped with bacon and sauteed with bell peppers, garlic, onion with Monterey cheese. Served with rice, beans and warm tortillas. Large prawns sauteed with butter, mushrooms, onions, green peppers and blended with tomatoes, herbs and spices, topped with melted Monterey Jack cheese. Served with warm tortillas. A classic taste. Large shrimp sauteed in garlic sauce with fresh mushrooms. Served with rice and beans. A must try! Large shrimp wrapped with bacon, ham and cheese. Smothered in our unique traditional creamy Portuguese sauce. Large shrimp sauteed with garlic and onions with a delicious cream sauce with Monterey cheese and mushrooms. For seafood lovers. Camarones al Mojo is a winner, fragrantly spiced garlic sauteed scallops and prawns, swimming with mushrooms in a Mojo de Ajo sauce. Served with rice and beans. Chimi from the coast, rolled fried flour tortilla filled with prawns, crab, sauteed vegetables, scallops and covered with a delicious creamy sauce. Tender grilled pieces of beef, shrimp, chicken, served over our New Mexican sauce and pico de gallo, topped with Jack cheese and served with rice and beans. Fajita style carne asada sauteed with bell peppers, garlic, onion with Monterey cheese. Served with rice, beans and warm tortillas. Have it all! Two Portuguese shrimp, charboiled chicken and carne asada. Served with rice and beans. Slowly roasted marinated pork, served with rice and beans, guacamole and warm tortillas. Skirt Steak flame-broiled to your liking. Served with green onions, guacamole and warm tortillas. Pork Loin braised in a green sauce of special fresh “tomatillos” (Mexican tomatoes), green peppers, onions and spices. Served with warm tortillas and rice and beans. Chile Verde, Chile Colorado, and Chile Relleno served with warm tortillas, rice and beans. Tender sliced chicken breast specially prepared with fresh mushrooms, onions and green peppers. Served on a bed of rice with melted Monterey Jack Cheese. Smothered with our special mild sauce and garnished with avocados and tomatoes. Tender chicken strips cooked in an authentic Mexican sour cream sauce with green peppers, onions and mushrooms. Served with warm tortillas. Chicken breast with rice and vegetables. Grilled fresh chicken breast served in an authentic Pueblan mole! Poblano pepper, chocolate, spices and fresh apples create this mysteriously dark, bittersweet sauce. Served with warm tortillas on request. A bed of Spanish rice, topped with sauteed chicken, broccoli, mushrooms, green peppers, onions, and topped with melted Monterey Jack cheese (not served with beans). Shredded chicken wrapped in a crispy flour tortilla, smothered with cream sauce. Topped with melted cheese and served with rice and black beans. Welcome to our beautiful restaurant. We hope you enjoy it as much as we did, getting it ready to serve you! Please feel free to contact us for any of your dining needs. We are committed to our community and will help you with whatever your needs may be.